The astronauts who will fly space shuttle Atlantis' final planned mission arrived at the Kennedy Space Center in Florida on May 10, 2010, 4 days ahead of their planned launch on NASA's STS-132 mission to the International Space Station. CAPECANAVERAL, Fla. ? The astronauts who will fly the space shuttle Atlantis? finalplanned mission arrived at their Florida launch site late Monday, four daysahead of their scheduled liftoff.? CommanderKen Ham led his STS-132 mission crewmates to a 6:49 p.m. EDT (2300 GMT) landingon the ?Shuttle Landing Facility here at NASA's Kennedy Space Center in Florida,the same runway where he will ultimately land Atlantis for the spacecraft?slast time. 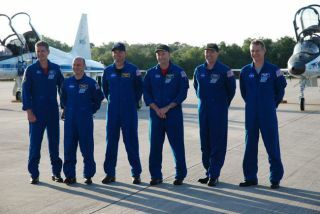 Theastronauts came to Florida from the Johnson Space Center (JSC) in Houston,Texas, flying in four T-38 training jets. They are due to launch Atlantis'final mission Friday, May 14, at 2:20 p.m. EDT (1820 GMT). ?Weare ready to launch,? Ham told reporters gathered at the landing strip. ?We?vecompleted every bit of training we can and we?re confident.? ?Lookfor a good show on Friday,? he added. Ham,STS-132 pilot Dominic ?Tony? Antonelli and mission specialists Steven Bowen,Garrett Reisman, Michael Good and Piers Sellers will deliver and install theRussian Mini-ResearchModule-1, also called ?Rassvet? (which means ?Dawn? in Russian) duringtheir 12-day flight to the International Space Station. Beforethat can happen though, an unmanned resupply spacecraft needed to undock fromthe station, which it did earlier today, and the outpost?s crew will need toreposition one of their Soyuz spacecraft to open the port where Atlantis? crewwill berth the new Russian module. ?Allthat?s got to happen in the next few days before we get off the ground,? Hamsaid. ?So once again, we?re in a situation where there is a heck of a lot goingon in space... and it?s pretty darn cool.? Theactivity will only increase during the STS-132mission. Bowen, Good and Reisman are scheduled to conduct three spacewalks-- two each in pairs of two -- to configure spare parts outside the station,replace batteries for one of the solar array wings, and add new hands to theCanadian-built robot, Dextre. Whilespacecraft are being shuffled in space, the STS-132 astronauts will spend theirnext few days at Kennedy reviewing final procedures for their mission. Ham and space-shuttle-atlantis-crew-arrive-100510will practice landing Atlantis by flying the Shuttle Training Aircraft, amodified Gulfstream II aircraft that mimics the handling and controls that theywill find on-board Atlantis. Althoughthe countdown to Atlantis? liftoff won?t begin until 4:00 p.m. EDT (2000 GMT)Tuesday, attention is already focused on when the STS-132 mission will end, asit will mark the finale for Atlantis? 25-year spaceflight career.? Unless theshuttle is called into emergency service for the very last space shuttlemission, STS-134, Atlantis? STS-132 mission will be its last. NASAis shutting down the shuttle program this year, a decision that was made in thewake of the Columbia accident in 2003. President Obama has proposed replacingthe shuttle fleet with commercial launch services to taxi astronauts to andfrom the space station. STS-132 is the 132nd flight of the shuttleprogram and the 32nd mission for Atlantis.